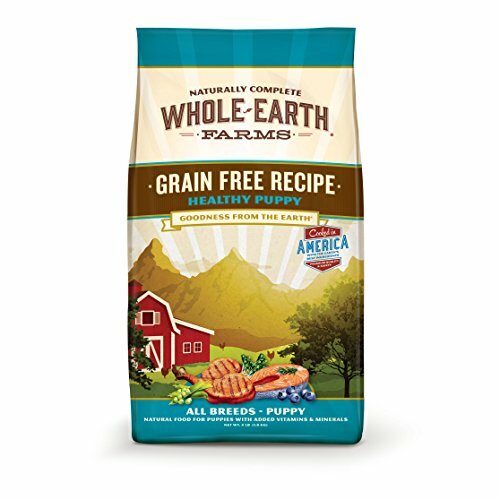 What to Look for When Buying Grain-Free Food for Puppies? 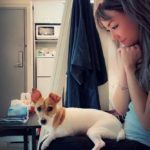 Does My Puppy Need Grain-Free Food? What are the Benefits of Grain-Free Puppy Food? Grain-free food is best for those who suffer from food sensitivities. Many pet owners opt for the grain-free options for their pets who have digestive issues or sensitive skin or allergies. 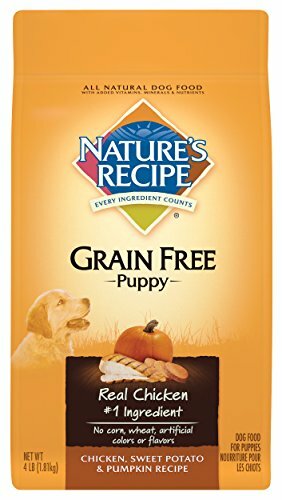 Grain-free puppy food generally has more protein than their grain-based counterparts, and contain higher-quality ingredients as well. Again, there have been many grain-free options mentioned on our lists of different kinds of dog food, and now we finally have one focused solely on the benefits of grain-free food! We’ve taken the time to sort through a ton of options and compile a list of the top 10 grain-free puppy foods. Grain-free puppy foods contain higher levels of protein, fats, and healthy carbs. All of the nutrients that are needed for a healthy and happy growing fur baby. A 100% grain-free option, this puppy food still provides your baby pooch with all the necessary nutrition for your puppy to thrive every day. The abundance of protein included in this formula is from premium chicken, turkey, and salmon. That is a lot of protein! Chicken is highly digestible and salmon is where our pups get DHA from, otherwise known as the fatty acid important for neural development and retinal function. 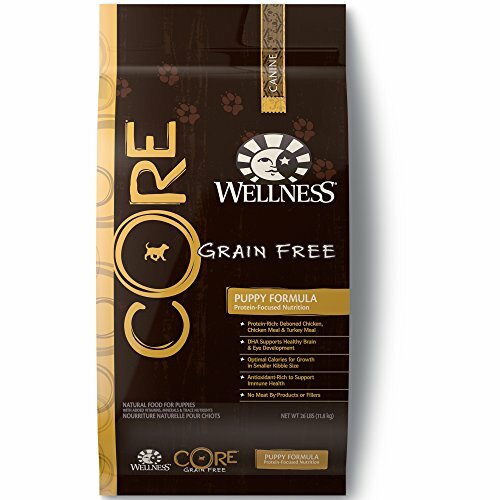 With all natural ingredients, Wellness Core really gives your pup the best with absolutely no wheat, corn, soy, meat by-products or artificial colors, flavors or preservatives. The wellness of your puppy is in their capable hands with every bowl you feed. Almost all of the grain-free options we’ve chosen to review today have no artificial colors, flavors or preservatives. Grain-free options have high meat and low carb combination with about 80% animal-based protein. Nulo adds patented BC30 probiotics to the mix that support healthy gut bacteria to help with digestion. Along with that, the DHA fatty acids help with cognitive development. Puppies that are regularly fed with DHA supplemented food are less likely to have destructive tendencies, like destroying your furniture! As puppies grow, they need lots of bone and muscle support. The calcium and phosphorus content work together to do just that and help with bone formation. 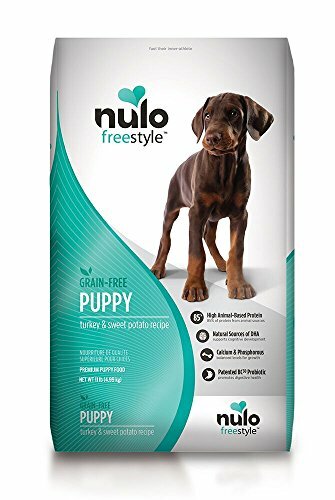 Why We Like It – Nulo puppy recipes can contain up to 84% of proteins from real meat! The real meat flavor is enticing and you can be sure your puppy will come running when he hears the kibble hitting his bowl! We’ve also included some wet dog food options for your puppy who likes extra flavor! 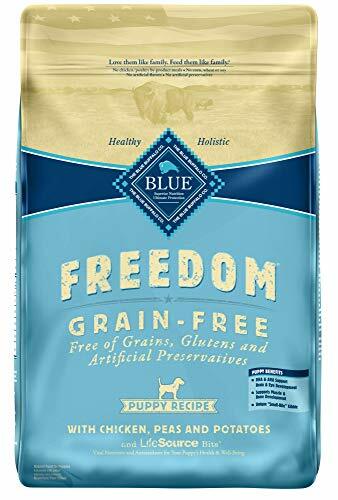 This puppy food from Blue Buffalo isn’t actually a grain-free option. 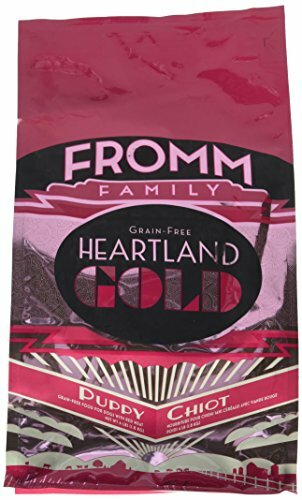 But we’ve decided to include this one because, for those of you who want grain in your pup’s food, whole grains are the way to go. Healthy garden vegetables and nutritious fruit are in this recipe to supplement the real deboned chicken as the 1st ingredient. Aside from that, this wet puppy food is also supplemented with extra vitamins and minerals to give your dog the most complete meal. A big difference between this wet dog food and other brands is it doesn’t contain wheat. Many wet dog food brands out there use wheat as a thickener. + No meat by-products, corn, wheat or soy. Why We Like It – Each formula from this brand only contains healthy and natural ingredients. This is easy on your puppy’s digestive system and easy on your mind. The deboned chicken as the first ingredient combined with whitefish gives your puppy the muscle support it needs and the DHA levels to be a smarty-pants! Give your dog the best there is with premium all-natural ingredients and no artificial colors, flavors or preservatives. You can count on Wellness to cut out all the harmful ingredients such as wheat, corn, soy, and by-products. Made in the USA, this puppy food is backed by the Wellness Guarantee, and is proudly made only in the USA. 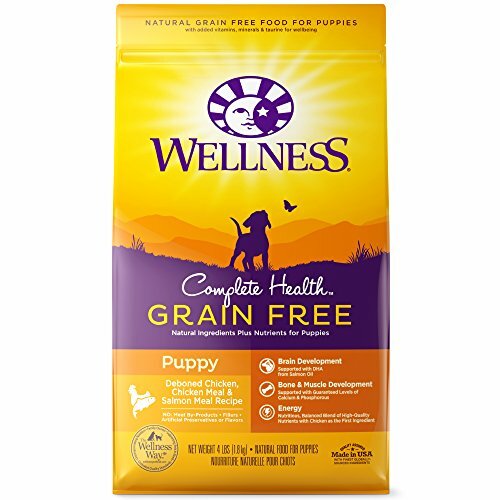 The recipes from this brand support the 5 signs of wellness in your puppy. Why We Liked It – The five signs of wellness that this brand guarantee includes the skin & coat, digestive health, eyes, teeth and gums, energy and immunity. Give your puppy all around protection with Wellness. If you have an average puppy with no special dietary needs, this is a great option for you. The first ingredient in all dog food must be protein and high-quality protein at that. A grain-free recipe allows for easier digestion and won’t upset your pup’s tummy. This also means there won’t be any signs of poultry by-products, corn, soy, wheat or any artificial flavors, colors or preservatives. Cooked in the USA, this puppy food is formulated to fit the needs of all puppies, for both large and small breeds. Why We Like It – One of the most important key factors of dog food is to be balanced and complete. Merrick provides a complete and balanced diet that will support digestibility, less shedding, a shinier coat and increased energy. 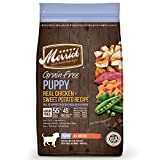 Not only is this a grain-free option, but it also carefully makes sure to not include any grains that might contain gluten, which a lot of us as pet parents want to avoid. It’s imperative for our pups do not have a drastic change in diet when they are weaned off their mother’s milk. The DHA and ARA fatty acids are ones we find in a dog mom’s milk. Along with Choline, these support cognitive development and retinal function. 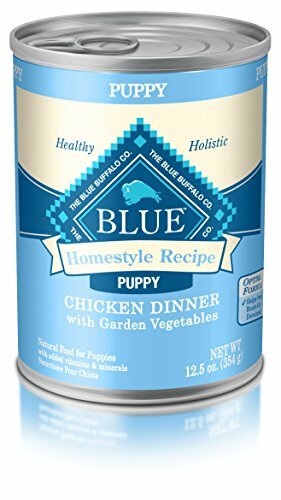 Fortified with a precise blend of antioxidants, vitamins, and minerals selected by holistic vets, you can feel safe giving your puppy Blue Buffalo puppy food. Why We Like It – Support your pup’s immune system at every life stage starting at the puppy stage with Blue Buffalo, who has their wellbeing as their number 1 concern. A guaranteed holistic and balanced nutrition, this is a grain-free, gluten-free, and potato-free option for your fur baby. 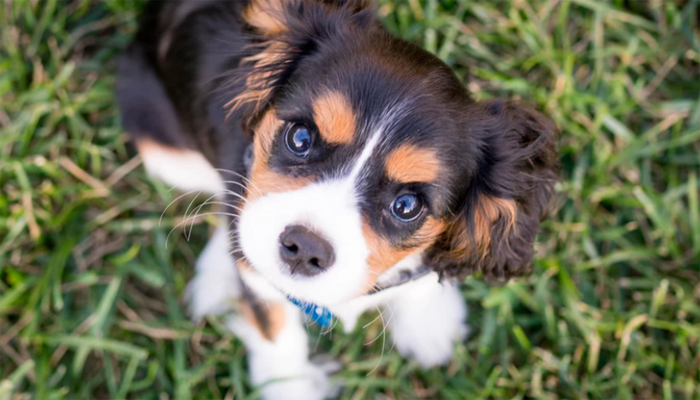 Puppies need the most support during their formative first year, and the rich source of DHA will support their brain development in the best way possible. The balanced ratio of omega-6 and omega-3 fatty acids also work together to help support a healthy coat and skin. 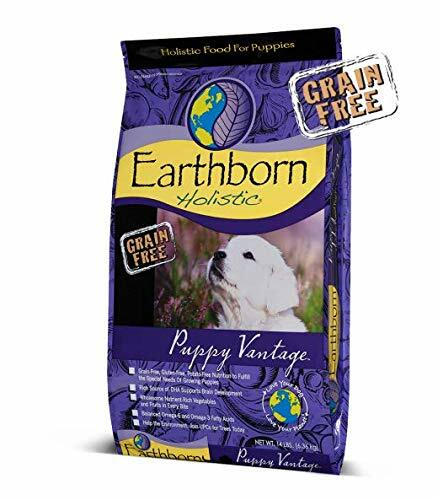 Earthborn cares for your pup but they also care for the earth! Their packaging is BPA-free and recyclable through their special program. Why We Like It – This brand of pet food is made in family-owned kitchens across the USA. The packaging is BPA-free and is recyclable through their TerraCycle and Earthborn ReBorn program to help plant trees. Oftentimes a grain-free recipe for puppies is nutritious and high-grade enough for even pregnant or nursing mothers! This red-meat recipe with beef as its first ingredient is formulated with probiotics to help with digestion. This is one of the trusted brands that meet the nutritional levels established by the AAFCO (The Association of America Feed Control Officials). Tell your puppy to get ready for balanced nutrition with no fillers or artificial preservatives, color, or flavors! As a family-owned and operated company, Fromm ensures every ingredient is tested and sampled for the highest of quality! Why We Like It – Fromm has many types of dog food for large breed puppies to nursing dogs. They provide a holistic recipe with high-quality ingredients suited for all types of dogs. This brand uses real chicken as the number 1 ingredient. 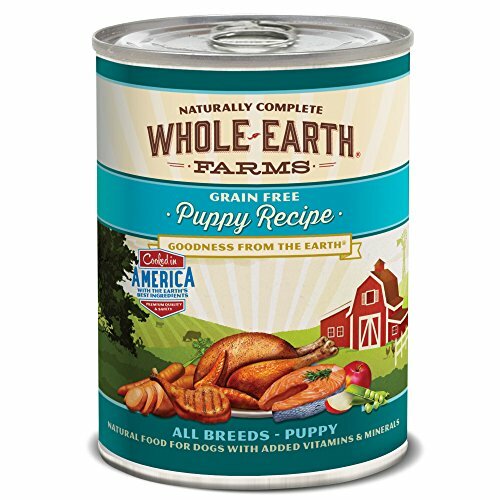 The grain-free and easy to digest recipe provides balanced nutrition for your growing puppy. They use natural ingredients, with added vitamins and minerals to make this premium choice of puppy food. The easy to digest ingredients do not include corn, wheat or soy. Specially formulated for dogs of all breeds and life stages, you can introduce your puppy to Nature’s Recipe at any time. No artificial colors or flavors are added into this mix. Make sure your dog stays active and healthy with this nutrient-dense meal. Why We Like It – The goal of providing your puppy with healthy and nutritious food is for them to live a long life next to you. Nature’s Recipe is committed to providing nutritious recipes for all dogs. Looking for more wet food options to blend in with your dry kibble? Here’s another one! Each recipe from Merrick includes their AAFCO compliant nutrient profile on their webpage. Ever transparent with their ingredients, Merrick concocts another grain-free recipe for puppies with sensitive stomachs that can be served as a full meal itself, or mixed in with dry kibble. Cooked in the USA with chicken as the first ingredient, this is a highly digestible formula. The all natural ingredients support a complete and balanced diet for your beloved canine baby. Grain-free dog food is the go-to food for sensitive pooches or ones with digestive issues. As they are grain-free, they should also not contain corn, wheat, or soy. Grain-free dog and puppy food are also high in protein and fiber to provide more nutrition for your furry best friend. The other purpose of feeding your pup grain-free dog food is to give them a diet that closely resembles what they would have eaten in a natural setting. Basically emulating what their wild and untamed ancestors ate. This makes the food more authentic, and true to their dietary needs without the processed junk some of their food might contain nowadays. Since grain is removed, your dog takes in more protein and fats. Grain is a controversial ingredient and the benefits and drawbacks are debated till this day. Whether or not you feed your pup a grain-free diet depends on you, unless they have special needs and sensitivities. Whenever you’re buying food for your dog, whether it be a puppy or a full-grown hound, there are certain things you must look for. We’re going to remind you of the basics, then take you through some things to definitely look for in grain-free puppy food. Complete nutrition – This means your pup will get what it adequately needs every day in terms of nutritional value and energy. Protein as the first ingredient – Make sure the first ingredient is named meat. This guarantees your puppy gets quality protein. Fruits and Veggies – These are always good in anyone or any animal’s diet. These ingredients give your dog the micronutrients it needs. Healthy additives – Some beneficial add-ons like probiotics, prebiotics, antioxidants, and the omega fatty acids are great to help strengthen your dog’s system. No by-products and unwanted ingredients – As we’ve said many times before, these are all no-no’s. Also, make sure nothing artificial and pointless is added. For example, artificial preservatives, color, and flavors. Dry dog food is the most popular and affordable choice of dog food. Dry dog food has a better nutritional balance than wet dog food. A good balance with all the necessary ingredients and nutrients needed is the best type of food for your puppy regardless of it being dry or wet. If you buy high-quality dry dog food it allows for better digestion and also cleans your pup’s teeth at the same time! Because of the nutrient-dense recipes, dogs require less kibble than wet food to fill up. Having a longer shelf life compared to wet food as well, this provides a cheap yet healthy option. Wet dog food options that are grain-free also typically contain more protein than the ones with grain. Hopefully, the wet dog food you choose substitutes the grain with animal-based protein instead of plant-based. Plant-based protein is deficient of some amino acids that could be immensely beneficial for your puppy. Make sure meat is still the #1 source of protein in your choice of food, rather than plant-based protein. This type of omega-3 fatty acid should be familiar to you by now. If you’ve read through some of our other articles on food, this is one of the most important ingredients to support cognitive and retinal development. For this fatty acid, look for any fish ingredients in your puppy’s grain-free food. They also help with their skin and coats, giving them a natural shine. The smaller the breed, the higher the number of calories it needs. Smaller breeds have a shorter development period, in which they need to ingest lots of nutrients and calories to grow well. For larger breeds, look for breed specific options. They should contain fewer calories so your pup won’t grow too fast and develop hip or elbow dysplasia or other joint problems. Many dogs actually don’t need a specific diet. Preference is one thing, but the real purpose of grain-free food is skin, coat and allergy issues. Grains are an unnatural source of nutrition for dogs. Due to this, some of them have trouble processing and digesting grains. People believe it was because their earlier ancestors didn’t eat grains, much like ours. This is a hotly debated topic, and we won’t get into the nitty-gritty. If you know anything about Darwin, you’ll know about the theory of natural selection. Over time, some dogs have genes that adapted through evolution to allow them to easily digest carbs, and that includes grains. A grain-free diet won’t harm your puppy, but it’s not absolutely needed in terms of health and nutrition. If your vet has decided that your dog has an allergy to grains, which means they do not possess the adapted genes, then a grain-free diet would be a good choice. If your puppy possesses any of the following symptoms, consult with your vet and try to work together to come up with a good diet plan. If grains must be a part of your dog’s diet, then go with whole grains. Most vets will say that grains making up a small part of your pup’s diet is harmless. A good ratio would be about 10% of the ingredients would be grains. Easy digestion is one of the benefits we mentioned above. Other benefits could be fewer meals and that regulates your fur baby’s weight. Grain-free food can apparently keep our dogs full for a longer period of time. Grains are heavy and can be tough to digest and give our pets what we know as a ‘food coma’. If grains are cut out of the equation, your dog will most likely have more energy. The less bloating, reducing the chance of food allergies, healthier skin shinier coat are all benefits we’ve mentioned before. If your pup suffers more from skin and coat issues, grain-free is the best option. If you suffer from your puppy’s halitosis, grain-free food is also said to give him better breath. Why not give it a try? Then you might not need to hide from your puppy’s passionate kisses. Giving our dog the best is our job. Better brands also use better ingredients such as potatoes, sweet potatoes, peas, and other carbs to substitute grains. Meaning they don’t use cheap fillers that are grain-based such as wheat, soy or corn, giving grain-free food higher quality. Always consult with your vet before making any major changes to your puppy’s diet. Make a short and handy list with all of our suggestions on it the next time you go looking for pet food. Slowly introduce any sort of new food into your dog’s diet by mixing in a little at a time. If your dog has any major reaction to the new food, stop immediately and contact your vet. 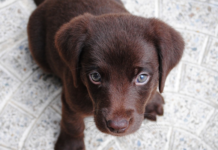 Diets which are high in protein can be damaging to your puppy’s kidneys. Because of the higher protein content in grain-free foods, make sure the label says it’s suitable for puppies. Some grain-free dog foods are only recommended for adults. If you insist on putting your puppy on a grain-free diet, we’d suggest you contact a vet to figure out what would be the most appropriate for your puppy.